My Crazy Life - Can’t Slow Down! The good news - foot is doing Okay! My brother’s leukemia is improvng! The bad is that a stitch is still in my foot and abcessed. Doc says it should work it’s way to the surface and then be fine. No shoes with backs on until after that. The ugly is my daughter’s and my vehicles. 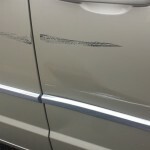 2 vehicles dented in 2 accidents that wasn’t our faults! UGH!!! SO glad March is over!!! Keep on keepin on!! Have been walking, basically, all week in flip flops, no crutches, no knee walker. Not totally planned but after returning from vacation after an emergency I left all of them down in my vehicle with my husband. Foot has been doing pretty well. Sore and bit swollen but considering I have now walked around Disney Magic Kingdom, the hotel, through the Tampa Airport ( 2 times because of phone dying and needed to get a charger and then back to get a wall plug instead of a car charger), through Indianapolis Airport, 4 trips up and down 4 floors at the hospital and today shopping at 3 stores for 4 hours, coming home and cleaning the house, and putting away clothes and luggage my surgical foot isn’t too bad. Wore an ace bandage all day and it REALLY helped. Too bad my non surgical calf has a muscle spasm in it now!!! UGH!!! My brother who was diagnosed with Acute Myeloid Leukemia on Tuesday is not doing too well. He has pneumonia and is coughing up blood. Trying differnt meds to see if it helps. He has had 2 back to back rough nights coughing and then his heart rate has gone up over 200 twice. We went through so much in 2014 with him. He was in a BAD car accident that almost killed him several times - all ribs broken, lung collapsed, blod clots in the lungs, crushed pelvis, cracked left shoulder blade, dislocated right shoulder blade, fist size hole in his diaphragm and shattered spleen. Got him through ALL of that and he returned to work after just 5 months. Was doing GREAT until this. However, it was caught early, stage M1 of 7 and only diagnosed because they thought he was having a heart attack at work and called an ambulance!! He has an angel watching over him!!! Stress, pain in my foot and being SO exhausted by all of this but STILL I am grateful that MY foot surgery and recovery is doing so well. Will happily take the pain if it means being able to be with my brother! Thanks all for your support! Well my vacation didn’t go quite as planned. I rode in the car for 12 hours the first day with just 2 breaks without my foot up. Swelled a bit but nothing major. Rode for 6 hours more the next day. Foot swelled more but still nothing major. Hip and siatic nerve hurt and ached but the next night I took a Zquil and slept pretty good. Walked without the boot for most of the day and wasn’t too bad. The next day we went to Disney World. Rented a scooter and used it but to be honest people would run into me, around me, hit me with their bags and it helped but was frustrating. During the day I received some devastating news. My brother, who was in a serious car accident a year ago and had just gotten back to work and that I am the Power of Attorney for ) has Acute Myloid Leukemia. My brother -in-law had this 2 years ago and passed away within 6 days. I chose to return to the hotel and then went back to the park. I chose to walk without the boot and without crutches or scooter. Was SORE but with the crowds and everything it just was too complicated. Caught a flight home to be with my brother and again didn’t use my boot, crutches or scooter - they were in the back of my van and we forgot them. Walked through Tampa Airport, Indianapolis Airport and then around the hospital. Swelled a bit but not too bad but was stinging. Rested and now ready to head home. Currently sitting in the hospital with my brother. Keep him and me in your prayers! Week 4 and I can DRIVE AGAIN!!! Went to my 4 week appointment and doctor was so impressed that I can now get out of the boot (if I get tired I need to wear it) but I can also DRIVE AGAIN!!!! My surgery was on the right foot and my life is TOO busy to be down that long!!! I am caretaker for my 94 year old grandmother, have 4 children (granted 2 are married and 1 lives 3 hours away) but I have a 17 year old at home who is getting ready to graduate and having prom in a few weeks. We are also leaving for vacation and the way it works in our house is I basically clean everything, organize the trip, pack, pack the van, make sure the snacks and drinks are in the van and arrange for all the animals to be taken care of. This being down has really been a pain in the rear end!!! I still have pain in my heel and if I get tired it REALLY hurts but after seeing some of the other blogs I have REALLY been blessed with fast healing. Over all I am feeling GREAT! Will wish all of you speedy recovery. I’ll let you know how things go at Walt Disney World and Hollywood Studios! Wish me luck with the two teenagers I’m taking with me!! UGH!!! No more stitches or steristrips!!! I lost the last steristrip last night! YAY!!! Was able to put some bio-oil on site to help as it had dried out sooooo much! Feels better already. Went outside yesterday (70’s and SUNNY!) and raked 5 flowerbeds and cleaned up all the dead plants from last fall. Packed for vacation. Worked on church items and all in all had a GREAT day. Foot was a bit swollen but not too sore. Elevated and rested all evening and woke up feeling fine! Tomorrow I return for my 4 week post op check. Hoping I can drive after that. I doubt it but a girl’s gotta dream! Then off to vacation!!! For all of you just starting out - hang in there! It DOES get better. Biggest suggestion I have is to KNOW your body and abilities! Keep your stitches VERY clean and do NOT get an infection!!! I was told to elevate, use frozen rice bags for icing your foot (it adjust to the shape of your foot and doesn’t get soggy!) My doctor said for the first 7 days post surgery - 5 minutes up for every 2 hours down. THAT’S ALL!!! I DID behave the first week! After that and if everything is going good listen to your body! It WILL let you know if you are doing too much and when to sit! Other than that be patient! (Says the MOST impatient person on the planet!) If you have a question post it on here! I have gotten GREAT suggestions and answers to help out! Have a GREAT day everyone!!! Slept great and NO PAIN in the morning! I had said before that in the mornings that I had stretching pain. The doctor’s office said to sleep in the boot - COULDN’T SLEEP AT ALL. If that didn’t work - ice it - MY FOOT FROZE! So last night I remembered I had this and used it. WORKED GREAT!!!! Not as bulky as the boot but still kept my foot in the 90 degree position so no stretching! Just letting you all know - something you might want to try! Today is my 3rd week - I had surgery on Feb. 19. Hasn’t been too bad so far. No infection, not too much pain and PWB. Doc says I’m about 2 weeks ahead of schedule! YAY ME! BUT, I did post that I worked in my gardens on Tuesday. I was not hurting while I was focused on the gardens but the past 2 days I have been sore. Just as ALL on here have said - take it easy!!! As you can tell from my other posts I do NOT approach life like that! I have had to sit with foot up and go back to using both crutches and occassionally the knee scooter. That’s okay. I knew from reading others posts on here that there will be setbacks. I have been listening and learning from ALL of you! I knew to slow down, elevate and rest. That is what I have done! THANK YOU!!! I feel like I’m back on track and though still somewhat sore, at least it is managable. One question I have for others - in the morning when you get up does your incision cite (I still have steristrips on) feel like it is pulling apart? And my heel feels REALLY STIFF! Is this something any of you have experienced? Called the doctor and spoke with the nurse and she thought it was from swelling but to look at the foot it isn’t swollen. At least not much. She told me to wear the boot overnight for a few nights (NOT working so well for sleeping!). Anyone have ideas??? Thanks all of you!!! Gardening with a boot and crutches! It was a BEAUTIFUL day yesterday- 70 degrees, Sunny, and with a lite breeze. Got outside and cleaned out 3 flower pots, put out spring flags and put Preen (a weed killer) out on 4 flower gardens. To those of you who are worried - I used the crutches and sat often! Got my 2nd stand up shower afterwards (again FELT GREAT!) and rested with my foot elevated. It’s days like that that make me feel FABULOUS!!!! Today I get to run around with my BFF from high school and the last 37 years!!! Look out Lafayette, Indiana!!! Achilles surgery - not going to keep me down for long!!! Another milestone - a STAND UP SHOWER!! Tonight I was able to take a shower - standing up - without my boot!!! Felt SO GOOD!!!!!! Also found a video on youtube for people that can only do sit down exercises. FELT so good to do SOMETHING for me!!!! Gotta get ready for Florida!!! Good day today!!! Post Op Doc 2 weeks and GOING GREAT!!! Post op 2 week check up and everything is going GREAT! 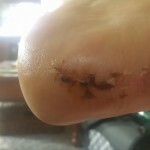 Stitches were removed. No infection and steri strips put on. Was told everything looked good on the xrays they took today and was told to go to PWB!!! Yeah like I wasn’t already doing that last week!!! SHHHH!!! Don’t tell on me! They said my foot would let me know when I am doing too much and after leaving the doctor’s office I walked around in the boot shopping and tonight it is sore and swollen so I have elevated and iced it. Hoping that in 2 weeks I will be given the okay to drive again - it’s my right foot of course so I’m going insane not being able to drive. Discussed the surgery with the doctor today and found out that the bone spur was HUGE and my achilles WAS detached already. He was surprised I was walking on it before the surgery. He complimented me on my pain tolerence and stamina. Who would have thought this overweight, stubborn woman would have it in her to keep pushing on! He did say that I had better not push it because of the high pain tolerence I might be more apt to reinjure it so I’d better watch it! Guess I might want to behave! HA! We’ll see!! !